Click to enlarge the day's schedule. Click on the arrow next to the title to get more information, the meeting details were provided by the meeting organizers. All meeting participants for the SCAR and IASC/ASSW Business Meetings need to be registered. When registering for participation in side meetings scheduled from 15 - 18 June 2018, please only select the category SCAR Business Meetings if the meeting(s) you are planning to attend are only/all listed as light blue on this page. If you are attending any other meeting(s), please select one of the other corresponding boxes. Registration information can be found here. Twice a day, coffee and refreshments are served for all registered meeting participants (10.30am and 3.30pm). The steering committee of the Astronomy and Astrophysics from Antarctica science research group will meet to discuss review activities in the past year, and future plans. Anyone interested is welcome to attend. The fast developments in monitoring bird and seal populations and habitats with remote sensing applications used unmanned aerial vehicle (UAV) including disturbance capability and environmental impacts of UAVs on bird and seal populations. The AG support scientific investigations to get recommendation for using UAVs near bird and seal concentrations. Another development is the use of Autonomous Underwater Vehicle (AUV) technology to investigate small-scale characteristics and changes. Much of this research is cross-disciplinary in its nature and this has led to noteworthy advances across a range of Antarctic scientific disciplines. The Action Group will focus in the future on such multi-disciplinary research and includes new and emerging research frontiers in Antarctic science. The AG will merge different studies especially animal monitoring via remote sensing. At the end we will show news about new satellites . Regular meeting to coordinate ADMAP's activities in the year immediately following publication of the second generation digital magnetic anomaly map of Antarctica. AntArchitecture is the name ascribed to a putative science programme whose underpinning goal is to use radar-imaged information on the internal structure of the Antarctic Ice Sheet - i.e., its internal architecture – to inform palaeoclimatic reconstruction and ice-sheet modelling of the future contributions of the ice sheet to global sea level. This workshop will bring together representatives of the AntArchitecture consortium to discuss ongoing plans since an opening workshop in Edinburgh in summer 2017. N.B. at the time of requesting this meeting the AntArchitecture group is applying for SCAR Action Group status. The SCAR Antarctic Thresholds - Ecosystem Resilience and Adaptation (AnT-ERA) research programme has been instrumental in developing a better understanding of biological responses to environmental change and the functioning of Antarctic ecosystems. Somewhat in parallel, the Distributed Biological Observatory (DBO) in the Arctic has been a bottom-up scientist initiative to evaluate ecosystem response to environmental change that has been supported by the IASC Marine Working Group and the Pacific Arctic Group in addition to national science agencies in six countries with Arctic research programmes in the Pacific Arctic. This meeting will bring together the science communities working at both poles who will jointly discuss topical scientific issues in Antarctic and Arctic biological processes. The major focus will be amphipolar comparisons and contrasts related to the response of organisms and ecosystems to climate change, including ocean acidification at all levels of biological organization. Core questions/issues that are anticipated for this session include increases or decreases in biodiversity and changes in ecosystem functioning (e.g. net primary production and biological CO2 uptake). Identification of challenges for future investigations, knowledge gaps, and dissemination of results are additional goals of this session. Coordination/general update meeting for the expert group. The meeting will represent an opportunity to synchronize with related groups: EG-BAMM, SCADM, ANTECO. The availability of instrumental observational data and proxy paleo climate data is increasing dramatically as new technology enables more extensive monitoring of the atmosphere-ocean-ice system over Antarctica and the Southern Ocean. However, making best use of such observational and proxy data to help improve model-based projections of future 21st century climate change is a challenging task since, not least since projections extend to a future that cannot yet be observed. The range of observational and proxy data can provide information on a range of spatial and temporal scales that can feed into the evaluation of different aspects of earth-system model (ESMs) projections. How can be best utilise these different sources of information in improving projections? There is also the development of statistical approaches such as emergent constraints, which exploits the range of behaviour across multi-model ensembles to identify which aspects of the observable climate system might have most impact on model disagreement on future change. The aims of this workshop of the SCAR AntClim21 (Antarctic Climate Change in the 21st Century) are to review recent (~5-years) progress in these areas and identify opportunities for future advances. The AnT-ERA scientific steering committee will discuss plans for the future including a summer school, a workshop and final products to be provided towards the end of the AnT-ERA life span. The Antarctic Near-shore and Terrestrial Observation System (ANTOS) is a SCAR Expert group that was created in August 2016 to coordinate a biologically focused, international effort to collect data necessary to assess environmental and biological variability and change in terrestrial and near-shore habitats across the Antarctic continent. Long-term goals of ANTOS include the establishment of technical guidelines for an internationally-coordinated installation of sensor networks, and standards for long-term data collection, storage, and sharing among national programs. This workshop will be used to inform the SCAR community on recent advancements in the development of an international ANTOS database, and the design of a manual describing the specific requirements of instrumentation needed for ANTOS installations. The results of an international survey that will be used to identify critical ANTOS installation sites based on currently existing long term datasets will also be reported. APECS will be hosting its "2nd APECS World Summit: Connecting the Poles" directly prior to the POLAR 2018 in Davos, Switzerland on 17 and 18 June 2017. This workshop will focus on interdisciplinary research connecting the Arctic and Antarctic and will bring together representatives from the APECS leadership and National Committees, as well as other early career researchers attending POLAR2018 to discuss the current and future state of research and collaboration between the polar regions. The first day will be a closed session for only APECS leadership and National Committee representatives focusing on topics such as collaborations between APECS committees as well as organizing education and outreach activities. The second day will be the "Connecting the Poles" Workshop day open to all early career researchers attending the conference and focusing on interdisciplinary research, tools for collaborations, inter-polar research working on both poles. The second day will be a mixture of keynote lectures and breakout groups. The organizers are planning to open registration for the workshop in September 2017. Limited travel support for summit participants will be available and announced when registration opens. Full information on the APECS website. Arctic Sustainability: A Synthesis of Knowledge (ASUS) is an international collaborative project that unites a team of diverse expertise from Canada, Denmark, Greenland, Iceland, Norway, Russia, Sweden, and the US to develop a framework that highlights the state of current understanding, best practices, and metrics for achieving sustainability in the Arctic. NSF provides support to the US team members of the ASUS consortium. The effort takes into account not only the social, demographic, economic, and environmental aspects of resilience in creating this framework, but looks at these across a range of scales using an inclusive process that engages a breadth of Arctic stakeholders. This is essentially a business meeting for ASPeCt. It will bring together all of the meeting attendees who are members of the ASPeCt group to give updates on the work that ASPeCt members have been doing. We will also discuss ideas/plans for new ASPeCt projects, some of which were proposed at the IGS meeting in Wellington, NZ in February 2017. This is the annual meeting of the BEPSII community. BEPSII serves as a unique forum linking modellers and field scientists studying sea-ice biogeochemistry and interactions with the surface ocean and atmosphere. BEPSII is an Action Group within the Life Sciences Group of SCAR and is simultaneously supported by SOLAS, CLiC and IASC. BEPSII Task Groups focus on: 1) improving biogeochemical methodologies; 2) stimulating new technologies and building large-scale databases; 3) understanding sea-ice biogeochemical processes through modelling and observational studies; 4) synthesise new (conceptual) models and evaluate changes of sea-ice biogeochemistry on polar ecosystems; and 5) outreach to the general public, stake holders and science community. The BEPSII community is a growing group of sea-ice scientists who work together in a stimulating atmosphere on overarching and integrative topics; we welcome anyone who can contribute to our mission. This meeting will discuss progress of the various BEPSII Task Groups and actions of the associated SCOR Working Group “ECV-ice”. If you would like to participate, please feel free to contact us. The SCAR action group Connecting Geology and Geophysics (CGG) gathers geologists and geophysicists with a common interest to untangle the tectonic and geodynamic evolution of Antarctica. CGG aims to identify key areas across the continent, where detailed geological field studies and geophysical investigation as well as drilling should be carried out in order to better understand the tectonic evolution throughout Earth´s history. CGG invites short presentation, which will be followed by a general discussion. The inaugural meeting of the CLIVAR/CliC Northern Oceans Region Panel Meeting, to introduce panel members, discuss a science plan, and plan next steps for the group. 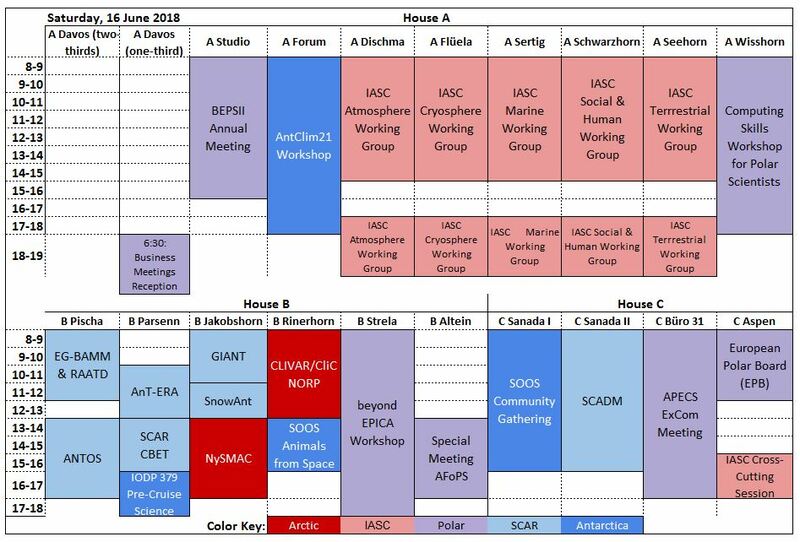 Note that Friday 15 June 2018, 1 - 5pm is a combined meeting with the CLIVAR/CliC Southern Ocean Region Panel (see below). SORP serves as a forum for the discussion and communication of scientific advances in the understanding of climate variability and change in the Southern Ocean. SORP advises CLIVAR, CliC, and SCAR on progress, achievements, new opportunities and impediments in internationally-coordinated Southern Ocean research. SORP-13 will focus on emerging issues in Southern Ocean research and linkages with the new Northern Oceans Region Panel. Note that Friday 15 June 2018, 1 - 5pm is a combined meeting with the CLIVAR/CliC Northern Oceans Region Panel (see above). CLIVASH2K is a new project from PAGES and Future Earth. The aim is to improve our understanding of large scale modes of climate variability and the mechanisms and drivers of climate change in Antarctica, the sub-Antarctic and the wider Southern Hemisphere during the past 2000 years. In this half day workshop we invite interested researchers working on a wide range of paleoclimate archives (ice cores, marine records, terrestrial and modelling) to come together to discuss ideas and plan activities within the CLIVASH2K framework. The workshop will involve a small number of invited talks and plenty of discussion. The workshop is open to everyone, but it would be helpful if you could let us know if you plan to attend. More information about CLIVASH2K. Business meeting of the Expert Group on Birds and Marine Mammals. The following working groups will report on their activities: Trophic Interactions, Health Monitoring, Remote Sensing, Tag and band sightings form, etc. Progresses of the Retrospective Analysis of Antarctic Tracking Data project will also be presented. The European Polar Board (EPB) is an independent European Organization of Directors and Managers of the major European National Polar Programmes. This is its annual plenary meeting. FARO aims to facilitate and optimise logistics and operational support for scientific research in the Arctic. The forum encourages international collaboration for all those involved in Arctic research. FARO acts as a forum for information exchange, establishment of cooperation and development of new ideas among the national logistics operators in countries with Arctic research activities. During IPY 2007/08 the IPY Education and Outreach Committee and national education committee worked together extensively on the theme of polar science and education. That provided a huge amount of education output on international and national scale such as working sheets, video conferences, polar days or schoolbooks. Especially polar expedition educators worked as multipliers for polar topics in schools of their own countries. Scientists as well as educators benefited from their cooperation. Since IPY the science – education collaboration has decreased overall, although working teams like Polar Educators Germany, the Portugal and Italian group or Polar Educators International (PEI) still have workshops and other major output. 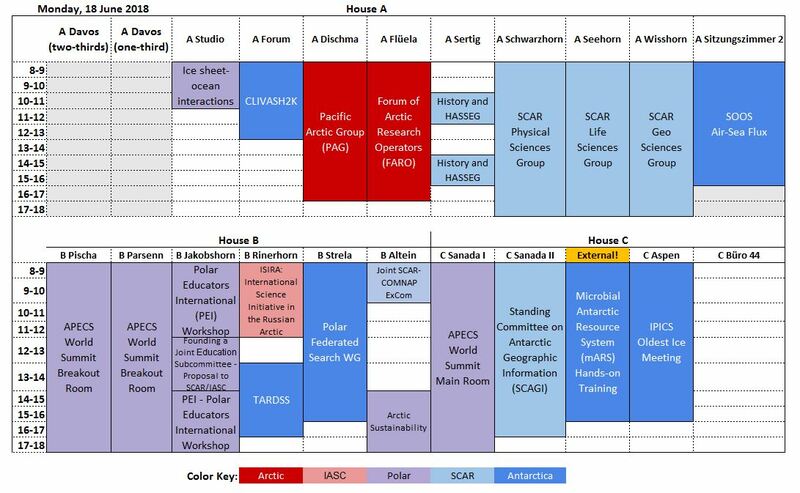 Now the SCAR & IASC Conference gives the chance to found a bi-polar education subcommittee which can initiate new approaches to polar cooperation and coordinate international science-education activities. The head of the subcommittee should be a member of SCAR and IASC and should participate in all their major meetings. Ideally there will be an education secretary as the head of the subcommittee, linked with PEI and located in a leading polar research institution funded by SCAR and IASC. All main countries active in polar science should have a member in the subcommittee. Structure, targets, approaches, working methods and possibilities in collaboration should be discussed in the side meeting between leading polar scientists and PEI educators. With improving accessibility to Antarctica, the need for recognition, protection and management of sites of value to Earth scientists is becoming increasingly important. Geologists, palaeontologists, geomorphologists and meteoricists often spend considerable periods undertaking field research in Antarctica, which may result in impacts on the Antarctic environment and the value of sites for future Earth Science research. In recent years, SCAR has produced Codes of Conduct for several field research activities, including working in geothermally heated areas, and in sub-glacial environments. The aim of this meeting will be to discuss the development of a SCAR Code of Conduct for Geological Fieldwork in Antarctica. The contribution of experts from different relevant disciplines will be essential to ensure the proposed Code of Conduct is comprehensive and appropriate for scientists' needs. The GeoMAP Action Group (www.scar.org/ssg/geosciences/geomap) is an international effort to gather both rock and surficial deposit information on existing hard-copy geological maps and compile it into a modern GIS framework. The group aims to build a dataset that defines exposed geology – describing the geosphere for both geological and multidisciplinary studies, providing information that can underpin studies of glacial dynamics and climate change. With large parts of Antarctica now covered by some form of digital information, much has been achieved since the group formed in late 2014. This meeting will provide: an update of progress in different sectors of Antarctica; formalise peer review and discuss integration of data into a seamless dataset; discuss the final data design and product delivery mechanism. (NB: There will be a separate workshop(s) at some stage in 2018 to iron out specific details of datasets). The GeoMAP team welcomes anyone to attend this meeting - particularly anyone interested in capturing geological data, helping to review mapping and datasets, or is interested in downstream use of these data. Geodetic Infrastructure of Antarctica (GIANT) EG is an expert group established to oversee the development of geodetic infrastructure across the Antarctic Continent to facilitate the monitoring of its physical processes. The group is acting as an advisory committee to help coordinate various infrastructure associated with earth monitoring techniques such as GNSS, gravity meters as well as the installation of tide gauges to monitor sea level change. The meeting will give a panorama on the GRAPE activities 2016-2018. New national projects and polar infrastructures will be presented. Discussion on the next steps will close the meeting. The History EG and the Humanities and Social Sciences EG will report on the year’s events and activities and discuss plans for the future, particularly ways in which the two groups can coordinate activities. We welcome input from interested researchers across all disciplines. The scientific core elements of IASC are its five Working Groups (WGs). The scientific scope of the Atmosphere Working Group includes scientific research towards understanding and prediction of Arctic change, and considering the fate of perennial sea ice and the global atmospheric consequences of its disappearance. This includes past climate states, investigation of Arctic processes across data sets and approaches, and climate model projections. The scope includes local and regional impacts of Arctic change. Representatives of national scientific organizations from all IASC member countries form the IASC Council that meets once a year during the Arctic Science Summit Week. The Council is the policy and decision-making body for IASC. The members ensure an input of a wide range of scientific and technical knowledge and provide access to a large number of scientists and administrators through their national committees. The scientific core elements of IASC are its five Working Groups (WGs). In this open session, the IASC community will hear about and discuss issues of interest to the whole breadth of its membership. The scientific core elements of IASC are its five Working Groups (WGs). The scientific scope of the Cryosphere Working Group shall include any scientific or engineering research relating to the Arctic and sub-Arctic cryosphere, including its interactions (past, present and future) with the climate, oceans, and biosphere. It shall also include the promotion of sound practices for the management of scientific data relating to the Arctic cryosphere and its interactions with other components of the Arctic system. The IASC Executive Committee will meet to prepare for the upcoming Working Group and Council meetings. IASC Fellows, Working Group Chairs, APECS representatives, and the IASC Executive Committee are invited to this meeting to discuss and share feedback on the IASC Fellowship Program. The scientific core elements of IASC are its five Working Groups (WGs). The scientific scope of the Marine Working Group shall include but not be limited to any marine natural science or engineering research. The scientific core elements of IASC are its five Working Groups (WGs). The scientific scope of the Social & Human Working Group shall include all aspects of social sciences and humanities research in the Arctic, as well as their connections with other IASC Working Groups. The scientific core elements of IASC are its five Working Groups (WGs). The scientific scope of the Terrestrial Working Group shall include any scientific research on Arctic terrestrial and freshwater environments, landscapes and biota, and their responses to, and interactions with, other components of the Earth system. The remit encompasses the dynamics of the Arctic system; past, present and future. We will present the first results and actions planned from the IASC cross-cutting working group. Snow is a key element of the arctic regions. Most projects of all working groups are directly or indirectly affected by snow. The overarching goal of this project ("task force") is to establish an improved common knowledge on snow related processes by linking snow-interested specialists in the different fields by different means. A second goal is to establish a snow measuring network at INTERACT-stations, especially for non-standard snow properties (stratigraphy and chemistry). This meetings aims at putting together the (paleo)modelling community with the geologists and oceanographers in order to understand the needs of both cimmunities and foster the interactions. Gaps have been highlighted during the PAIS conference in Trieste and both communities started to think together how to optimize the data campaigns to help modellers and modellers formulated specific request on the types and the locations of data needed and their related climate processes. This meetings aims at formulating precise key scientific questions that will define the outline of the future PAIS research strategy and can bounds with the other SCAR programs in view of the next IPCC report. A meeting of the people interested in planning and developing a proposal for a new interdisciplinary Scientific Research Programme with a focus on integrated conservation planning in Antarctica and the Southern Ocean. The proposal for the Scientific Programme Planning Group (SPPG) will be put to the appropriate meetings in Davos, with the full SRP proposal to be presented in Hobart, 2020. The purpose of this meeting will be to finalise the proposal for the SPPG. The SCAR Action Group on Integrated Science for the Sub-Antarctic (ISSA) was formed in 2014. It’s objectives are to 1) Provide a comprehensive overview of past and current sub-Antarctic science, 2) Identify pressing science questions for current and future work based on national priorities, strengths, and 1st SCAR Horizon Scan questions, 3) Identify key lessons for science, conservation, and policy across the region, 4) Develop a network of scientists across the region, including support for early career researchers. In our first two meetings we idetified priority work areas for the subantarctic and identified approaches to ensure observations are comparable across longitude/latitude and through time. 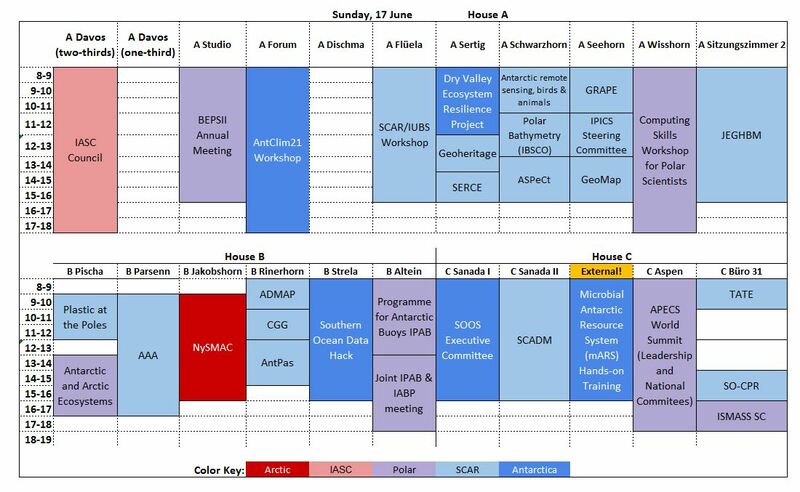 At POLAR 2018 we will update progress on publications, field achievements and brainstorm how to deliver more widely on the Subantarctic Science Challenges and how to assist sceintists with achieving ISSA goals in these difficult to reach locations. The IABP meets once per year to coordinate buoy deployments on the Arctic Ocean and its peripheral seas. Each Participant shares reports on their field activities during the past and for upcoming years. This year, the IABP meeting will focus on coordinating their deployments with large field programs such as Multidisciplinary drifting Observatory for the Study of Arctic Climate (MOSAiC ), and Years of Polar Prediction (YOPP). The IABP plans a joint session with the International Programme for Antarctic Buoys (IPAB) on Sunday, June 17, 2018. Interested participants need to contact the organiser. Business meeting of IPAB, with members providing updates on recent/current/upcoming activities, identifying observational gaps and sharing ideas for future field work, including those under YOPP. The IPAB committee will coordinate a review of buoy hardware and inform about recent/upcoming Data Buoy Co-operation Panel activities. IPAB members will discuss data issues (incl database, data sharing/access, metadatar), new tools (i.e., the Due South field planner), and the future roadmap of IPAB, incl. joint activities with the International Arctic Buoy Programme (IABP). Amundsen Sea drilling program pre-cruise science party gathering for discussion of science objectives and drilling strategy. One of the key objectives in future ice core research identified by the International Partnerships for Ice Core Sciences (IPICS) is the search for a 1.5 Myr old ice core in East Antarctica. Several national and transnational projects are currently in the pipeline to achieve this goal. This meeting will allow the members of IPICS to exchange plans, scientific results and coordinate the Oldest Ice activities. If sufficient members of the IPICS SC are present then we will hold a Steering Committee meeting. Normally SC business is done by email with only occasional meetings; this would be the first for 2 years. Advising on funding and implementation of projects. Supporting Russian and international early career scientists. Steering committee meeting for the expert group on Ice Sheet Mass Balance and Sea Level (ISMASS), an activity co-sponsored by SCAR, IASC, and CliC. Recent research shows continued ice mass losses from the Greenland and Antarctic Ice Sheets in the light of continued global warming. The purpose of this workshop is to: (1) review recent observational estimates, and their related uncertainties, of ice sheet mass balance (including surface mass balance, basal melting and solid-ice discharge components) and their response to climate change, and to reach a consensus on the magnitude of current ice-sheet contribution to sea-level change; (2) review recent improvements in ice-sheet modelling and the use of updated mass-balance observational datasets in ice-sheet models; and (3) disseminate this improved understanding both to other researchers and also to policymakers and the general public. An important emphasis will be exploring data-model linkages and making appropriate recommendations to the research community, which will highlight any remaining deficiencies and outstanding opportunities for collaborative work. This workshop is a timely update of the 2012 Portland ISMASS workshop on a broadly similar theme, and is expected to provide a timely review of the current state of the science in advance of the next Intergovernmental Panel on Climate Change Assessment Report that is due in around 2021. Click here for the detailed program and list of talks and speakers. Medical expert group considering issues within the practice of medicine in the Polar regions and research initiatives and projects. mARS is an information system dedicated to facilitate the discovery, access and analysis of polar environmental context (physiochemical) and molecular microbial diversity (meta)data. Projects can be registered through a Global Biodiversity Information (GBIF) portal and then environmental data sets and accompanying sequence sets, if available in public repositories, can be uploaded into a searchable mARS database. As of later in 2017, mARS will expand the coverage of data sets to include the Arctic. A hands-on workshop will include information on preparing internationally accepted environmental context data and submissions of data sets to sequence repositories (e.g. EMBL, NCBI) will be the focus of Day 1. Data processing pipelines for next generation sequencing analysis of microbial diversity data (focused on 16S and 18S rRNA) as well as discussions of meta ‘omic data analysis tools for both amplicon and ‘omic data will be demonstrated and discussed on Day 2. Time will be allocated to practical hands on learning to facilitate an interactive learning environment. Participants are encouraged to bring a computer, projects to register and any associated data if they wish to work on their own data. Example data sets will be available. A small workshop registration fee will be required. Ny-Ålesund is a Norwegian research and monitoring infrastructure, hosting national and international research projects and programmes. Ny-Ålesund serves both as an observatory, laboratory, and field base for Arctic research. Ny-Ålesund Science Managers Committee (NySMAC) was established to enhance cooperation and coordination among researchers and research activities in Ny-Ålesund, and includes representatives from all parties with major vested interests in Ny-Ålesund. The Pacific Arctic Group (PAG) is a group of institutes and individuals having a Pacific perspective on Arctic science. 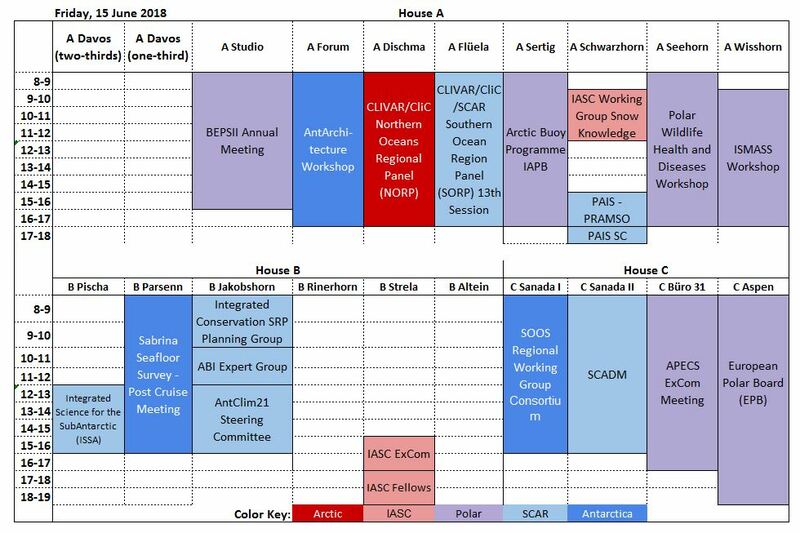 Organized under the International Arctic Science Committee (IASC), the PAG has as its mission to serve as a Pacific Arctic regional partnership to plan, coordinate, and collaborate on science activities of mutual interest. The four PAG principle science themes are climate, contaminants, human dimensions and structure and function of Arctic ecosystems. This workshop aims to provide the Antarctic climate and palaeoclimate communities with the coordination and support for proposed and developing shallow and deep sea drilling projects. This includes identification of site survey needs, discuss recent results, ongoing and future projects. Since the introduction of plastic materials in the 1950s, global production has increased more than 500 times. Evidence of plastic debris in both Polar Oceans suggests that they have already spread across the world, and are thus recognized as one of the most important worldwide threats for oceans. However, while there has been a great deal of research into plastic pollution in the more populated regions of the world, little is known about the Polar regions. This is an emerging and timely area of research which necessitates a co-ordinated scientific focus. Collate information on plastic pollution in the Antarctic and Arctic regions. Assess occurrence, distribution, source and fate of plastics (nano, micro and macro) in Polar regions. Estimate current levels of pollution in the poles and evaluate the impact on the ecosystem. Generate a Best Practice protocol for plastic collection and analysis in the Polar regions. The workshop is open to scientists from different disciplines with interest in the processes regulating the distribution, magnitude and ecosystem impact of plastic debris in Polar environments. Experts on marine plastic debris policy change and mitigation are also welcome. The community based polar mapping initiatives International Bathymetric Chart of the Southern Ocean (IBCSO) and International Bathymetric Chart of the Arctic Ocean (IBCAO) invite persons with a background in polar bathymetric data acquisition to discuss recent and future mapping projects. Information on the current status of the mapping initiatives will be given with the possibility to discussions. Polar Educators International (PEI) is a vibrant international network of educators and researchers, promoting polar education and research to a global community. It is our aim to provide a deeper understanding of current polar science to a broad international community including teachers, students, researchers, early career scientists, and the general public. In addition, our goal is to encourage clear and accessible communication of current research results. 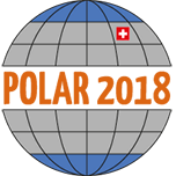 The Polar Educators International Workshop at Polar2018 brings together educators and researchers in a collaborative workshop discussing the polar communication needs of this dual audience. Educators (both formal and informal and all age levels) benefit by building their polar research background knowledge and sharing ways to transfer that science content to their individual educational settings. Researchers benefit from communication strategies that work for all non-technical audiences. The focus of this workshop is designed to provide educators with the tools and strategies to meet the needs of their teaching situations. PEI’s workshop will intersect with the concurrent APECS (Association of Polar Early Career Scientists) workshop in innovative and exciting ways to meet the needs of both groups: educators and researchers. The Polar Federated Search Working Group will report on progress to-date and plan activities for developing federated data discovery tools for the Arctic, Antarctic, and Southern Ocean. Presentations will include follow-up from the Polar Data Planning Summit in May, 2018, and discussions of existing federated search options. This side event is an initiative from the Working Group of Health Monitoring of Birds and Marine Mammals of the EG-BAMM. This 2018 year is 20 years since the organization of the Antarctic Wildlife Diseases Workshop in which for the first time it was paid attention to the problem that potential outbreaks could pose to Antarctic wildlife. The goal of the present workshop will be update the information about these issues and the protocols for surveillance and analyses of samples in case of mass mortality events under the light of the new techniques and developments of the last two decades. In this time a polar perspective will be included on the discussed aspects. A one day meeting covering the summary of results to date from the Sabrina Coast, East Antarctic, mission undertaken between Jan-Mar 2017, on the RV Investigator. 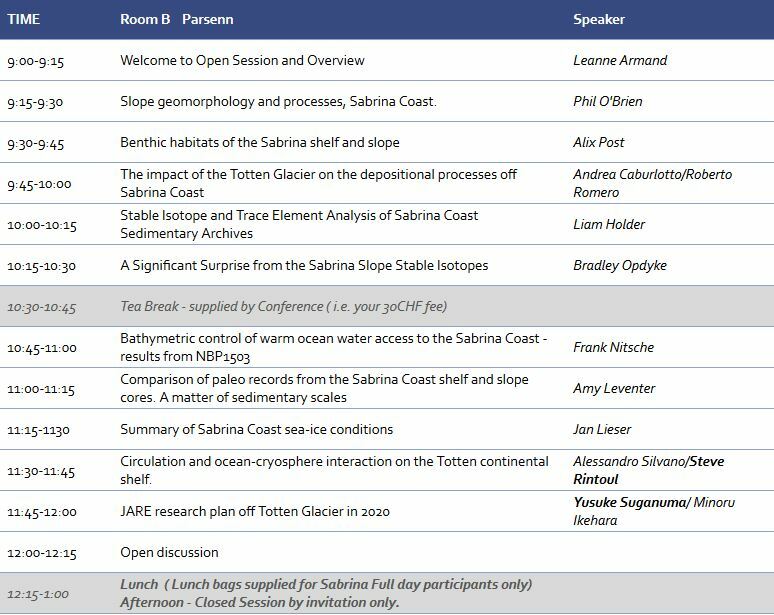 First half of the day is an open session covering specific outcomes from various studies across the bio and geosciences, and palaeocenaography/climatology and potentially oceanography. Second half of the day is a closed session for project PIs and their students. The main topics of the meeting would be reports on the different activities of CBET with a presentation by one of the SCAR Award recipients. For non-Committee members information would be provided on how to participate in SCAR CBET activities. CBET Committee and SCAR Secretariat members will be available to answer questions on CBET initiatives and SCAR Awards. Biennieal meeting of the SCAR Geosciences group. This will include an update of all scientific research programmes, action and experts groups in the geosciences field. This workshop is organized with the aim to increase the interactions between the SCAR and the International Union of Biological Sciences by integrating the Antarctic perspective throughout the SCAR scientific programs into the IUBS scientific programs. Biennieal meeting of the SCAR Life Sciences group. This will include an update of all scientific research programmes, action and experts groups in the life sciences field. Biennieal meeting of the SCAR Physical Sciences group. This will include an update of all scientific research programmes, action and experts groups in the physical sciences field. Business meeting for the SCAR SRP: 'Solid Earth Response and influence on Cryosphere Evolution' (SERCE). During the meeting we will review recent and forthcoming activities associated with this group, including workshops, summer schools, thematic conference sessions, and data exchange and archiving activities. We welcome input from the polar community on future activities that would further strengthen links between scientists working in the fields of Solid Earth and Cryosphere sciences. The meeting is open to all. Progress, future and plans for project concerning snow in Antarctica will be discussed. Coordination of snow measurements and intercomparison will be part of the discussion. The purposes of the workshop are to discuss future road map of the SO-CPR program such as future training methods, data (metadata, database, data sharing), gap analysis (spatial, temporal, data, quantitative) and next workshops/conferences. The SOOS Southern Ocean air-sea flux (SOFLUX) working group was developed in 2015 with the core aim of reducing uncertainties in air-sea and air-sea-ice exchanges in the SO. SOFLUX now has clear terms of reference and aims with 4 task teams developed to progress the WG objectives and deliverables. This side meeting will allow WG members to actively discuss progress and plan towards executing specific aims and ambitions of SOFLUX. The SOOS Community Gathering was cancelled. The room will be used for a writing workshop for the previously interested participants. A one-day meeting of the SOOS Executive Committee to discuss the strategic direction and activities of SOOS. A one-day meeting of the co-chairs of SOOS Regional Working Groups, with the aim to ensure integration and standardisation of approaches and effort across all groups. Participation limited, please contact the organiser. Core Southern Ocean datasets are being integrated into collections ready for use in analysis tools such as OceanDataView, Matlab, R and Python. This day will be an opportunity for ocean scientists to work with expert data managers to explore and analyze these collated datasets with a view to generating new publications and resolving old scientific questions. This workshop is supported by the NSF-funded SeaView project (www.seaviewdata.org) and the Southern Ocean Observing System (www.soos.aq). Open to anyone; pre-registration requested. Meeting of the SCAGI group to hear National Reports for geographic information activity in Antarctica, review progress with the SCAGI SCAR products and plan future work by the group. Meeting to show and seek feedback on the development of a tool to assist in the planning, permitting, and implementation Antarctic activities while limiting adverse impacts on the Antarctic environment. The tool will allow overlaying and querying of spatial data including environmental variables and human activity, and has been designed to be applied to any part of the Antarctic continent. The tool is based on the established principle of a ‘spatial decision support system’ (SDSS), which is an interactive approach that provides evidence to support management using analysis of spatially explicit data. As an original signatory of the Antarctic Treaty and the Madrid Protocol on Environmental Protection, New Zealand has an enduring international obligation and deep national commitments to ensure the highest standards of management for the continent based on scientific evidence. In particular, New Zealand has a special responsibility for the protection of the McMurdo Dry Valleys, which face increasing human activity, effects of climate change, and growing risks of invasion by non-native species. The Dry Valley Ecosystem Resilience (DryVER) programme is an international interdisciplinary project aimed at developing objective, evidence-based planning and management tools for the McMurdo Dry Valleys of Antarctica (MDV). The project’s foundation will be a comprehensive understanding of the resilience and sensitivity of MDV habitats to human impacts and invasive species. This understanding will be gained through rigorous fieldwork, laboratory analyses and experimentation, remote-sensing and instrument-based data collection, and climate and ecological modelling. The information will be spatially explicit for direct integration into an interactive GIS framework that that will map and predict biodiversity, productivity, and sensitivities to impact, invasion, and climate change across the entire MDV region. This workshop will be designed to inform the SCAR community about the DryVER programme and to solicit feedback on current accomplishments and projected outputs.